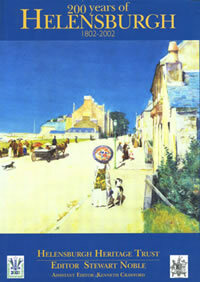 HELENSBURGH Heritage Trust published this book in May 2002 to mark the bicentenary of the burgh. It is a handsome hard-backed book with many original illustrations by local artist Neil Macleod, many colour reproductions of oil and watercolour paintings, current photographs by Donald Fullarton and Neil MacLeod, and reproductions of photographs going back to the early days of photography. There are 19 chapters, each covering a different aspect of the area and its people and each written by a member of the Trust. The editor was Stewart Noble, chairman of the Trust, and current Trust president Professor Malcolm Baird, son of John Logie Baird, wrote a feature about his father. The late Jimmy Logan OBE, the previous Trust president, contributed an article about entertainer Jack Buchanan. This is not a book to be picked up lightly like a novel. It is really a reference book which covers a wide range of subjects. The authors have a wealth of knowledge about their subjects and all the facts have been meticulously checked, not only by the authors but also by the editors. The book has sold very well. It is still available from the Trust and local bookshops, and requests to buy it still keep coming in from both home and overseas. In March 2007 Stewart Noble completed a list of corrections and further details, and this can be seen in this section of the website.